Here is my submission for Theme Space! 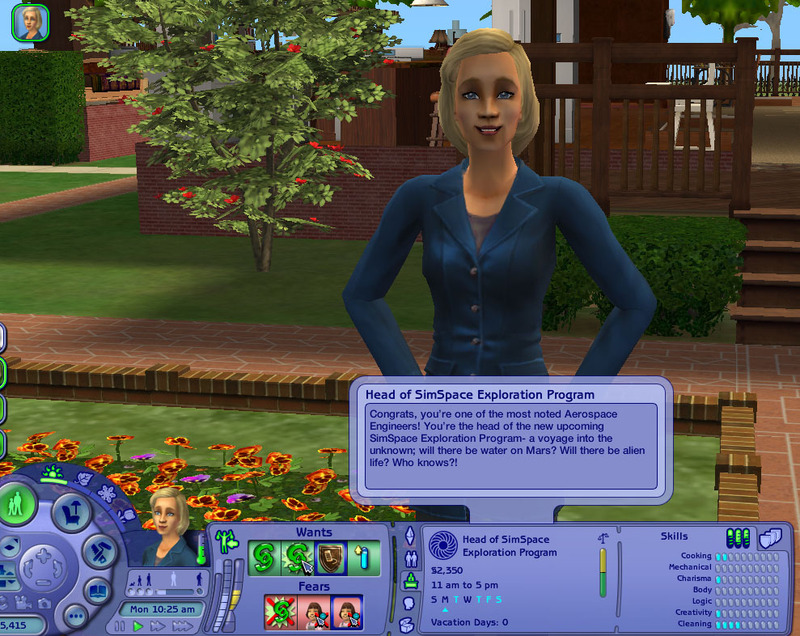 A cool career for the space loving, logical and mechanical enthusiastic Sims. Big thank you to Elizabeth Aspir from Desiderata Valley for changing careers! Description: Welcome to the SimSpace Aeronautical Laboratories where you’ll be assisting & observing top engineers in creating the newest spacecraft for outer space exploration programs. Description: Your job is to research on various factors such as fuel efficiency, flight safety and compiling data information. Description: You’re now a technician specialising in trialling and testing new concept designs. You investigate design flaws that could potentially cause accidents and take part in flight-test programs. Crash dummies at the ready! Description: You and a team of other geniuses are developing a new Earth observation satellite. Rumour has it that this program is being funded by the government and private investors. Description: Now you focus mainly on the electronic systems that are in aircrafts, satellites and shuttle. Those systems monitors fuel, pressures and create communication back to base camp. Earth to Simspace, can you hear me?! Description: Your previous skills as a technician and engineer will come back in handy now. You’re head of a team that resolves issues that arise during the design and development. You oversee that all goes well during manufacturing. Description: Back to the drafting board- you’re the leader of a team that designs new concepts for aircrafts, satellites and shuttles. Your experience in avionics, data research and trialling make you well skilled and knowledgeable for this role! Description: You now specialise in a specific type of engineering called Propulsion- its all about improving the performance and reliability of compressors, jet engines, and rocket motors. It’s all about the force, baby! Description: Long hours, big piles of work on your desk. You’re the systems integration manager; you oversee a team of 12 direct reports, to lead the SimSpace team and providing technical direction and decision making for project deliveries. Description: Congrats, you’re one of the most noted Aerospace Engineers! You’re the head of the new upcoming SimSpace Exploration Program- a voyage into the unknown; will there be water on Mars? Will there be alien life? Who knows?! 1) Whilst pottering about in the lab, $me notices a small pile of dented metal sheets on the floor. Does $me throw it in the bin? 2) $me is hard at work compiling data information that’s due for a team presentation in the morning. Suddenly their colleagues burst into the office and are laughing away, “Come on $me, lets go the pub!” says one of them. Does $me join them? 3) Whilst using Mona the crash test dummy during a test run, $me notices that Mona isn’t strapped in properly into the seat. With only seconds left before “take-off” should $me halt the test and check? 4) Rumour has it that the government and private investors are funding this Earth observation satellite that $me is working on. $me is rather curious about it all, should they do some snooping? Chance A Good: $me decides to snoop around their boss’s office and find out information. Suddenly, $me boss walks into the office and says “Hey, what can I help you with?” $me lies and says they were just dropping off paperwork. 5) Whilst playing about with some circuit boards, $me notices a potential flaw in one of his colleagues circuit boards. Does $me kindly notify their colleague? 6) $me is quite sleepy and their department is running quite smoothly, should $me take a quick nap in their office? 7) Whilst drafting a new aircraft design, $me becomes aware that is quite similar to one designed by a rival company, does $me continue with the design? 8) $me is working with their team on a jet engine design using 35million “Llama Power”. $me doesn’t think this type of engine power is strong enough, does $me express their concerns to their team? 9) Whilst overseeing one of the teams, it comes to $me’s attention that one of the workers is taking photos of the drafted designs. $me thinks this could be a mole, do they confront the worker? 10) Whilst being interviewed on live television, a journalist shouts “Do you believe in aliens $me?” …Well $me, do you believe in aliens? •	I've included a glossary in the zip file explaining terminology used in this career. •	I’ve used the Hatchback, Sedan, Town Car & Limo as work vehicles. •	I’ve used the Lab Coat, Cheap Suit, Tweed Jacket &Power Suit as the work outfits. •	I’ve used the Hydroponic Garden as the Career Reward, a bit random. •	I’ve tried making the chance cards interesting & realistic as possible. 42 people have said thanks to XxCTxX for this download.